Metallica lights up the big screen with its IMAX 3D feature, "Metallica Through The Never", which premiered September 27, and Robert Juliat fixtures helped light up the concert portion of the movie courtesy of Spotrental North America in Manheim, Pennsylvania. Directed by Nimrod Antal ("Predators"), "Metallica Through The Never" takes a hybrid approach to plot interspersing a concert by Metallica with a dark fantasy narrative about a roadie who encounters a post-apocalyptic situation that, true to the band’s philosophy, leaves a lot of interpretation to viewers and fans. Metallica’s previous film was the 2004 documentary, "Some Kind of Monster." The new movie has no dialogue – rather, the 16-song soundtrack runs throughout the narrative portion of the film. Following its one week exclusive run in IMAX Theaters, "Metallica Through The Never" opens on 3D in theaters nationwide on October 4. Spotrental supplied eight Robert Juliat Aramis and four Cyrano 2500w HMI followspots to the production for the concert portion of the film. "There were four actual concerts shot for the movie," explains Joe Zimmerman of Spotrental. "They wanted to make the spots as unobtrusive as possible, so we put the stands over the top of the seats. The stands for the Robert Juliat fixtures are easily adjustable compared to other followspots." 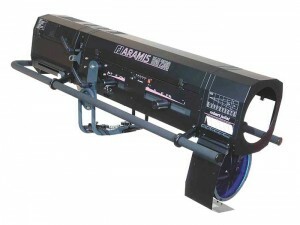 Aramis is often used in concerts and is constructed to withstand the rigors of touring. It’s well suited to the long throws of big venues indoors and outdoors. Cyrano does everything that Aramis does plus its narrower beam angle makes it perfect for really long-throw distances; its filters also offer additional design possibilities. According to Zimmerman, the lights "performed flawlessly. They were so bright that we actually had to bring them down. The consistency of field was very even all the way across – there were no hot spots. These fixtures are very solid and almost never go down." Zimmerman says the lights’ "maintenance is very good" and "service with the factory is the best of any manufacturer we work with. We always get the information or service that we need. The Aramis and Cyranos are great lights – I really like them."